Home » Natural Remedies » What Is Dry Brushing? Have you heard of dry brushing? The name basically explains what it is — you use a dry brush to, well, brush yourself. Now you may be asking why on earth someone would brush themselves, but hear us out, it has many benefits. The main benefit to dry brushing your body is to increase blood circulation and lymphatic flow. If you don’t know, the lymphatic system is a network of tissues and organs that help transport metabolic waste out of the body. The lymphatic system includes the thymus gland, lymph nodes, spleen, liver, and tonsils. As you age, your lymphatic system slows down just like every other system in your body, and this compromises your immune system. Muscle contractions are key to keeping the lymphatic system working properly. An easy way to reach the lymph vessels is to simply brush your skin, as they lay close to the surface of the skin. Therefore, simply brushing yourself is an easy way to improve your circulation and immune system. There are several different types of dry brushes, some with handles and others that are like gloves. You preferably want a brush with natural fibers. You may want a few brush options so you can reach all areas of your skin. The best way to start dry brushing is to begin at the bottom and work your way up. For example, begin at the soles of your feet and ankles and move the brush in a circular motion. From there, work upwards to your calves and knees. Strokes here should be long and even as if you were shaving your legs. Continue to move upwards to your thighs and hips and continue back in a circular motion. When you reach your neck and chest, be gentler here and continue to the shoulders. The last stop should be the front and back of your abdomen. 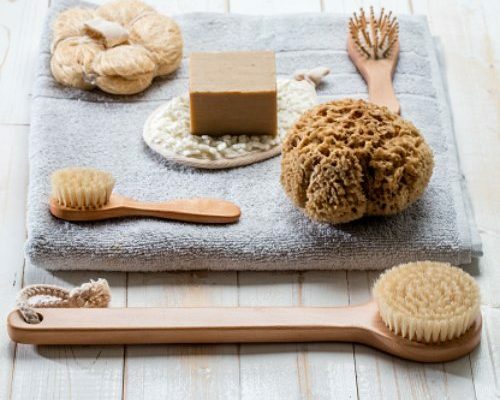 You can dry brush every day if you like, but if you don’t have the time, two to three times a week is sufficient to experience the benefits of dry brushing. Ensure you keep pressure light as to not cause damage to the skin.